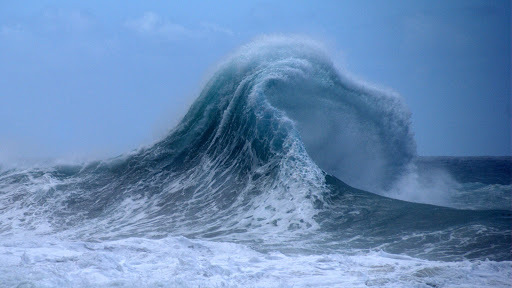 Waves have captivated humankind since the dawn of time. They can be seen in art throughout the ages, from ancient Japanese woodblock printing right up to modern photography, which form the basis of this article. It’s hard to explain why we’re so fascinated by these wind-generated ripples, which serve as symbols of the immense power held by the world’s oceans. Perhaps it’s that they’re fun, impressive and often terrifying, all at the same time. Thousands of photographers have devoted their professional lives to capturing waves in their purest form. You’ll find a selection of the best of wave photography below. Have a great day, and don’t forget to subscribe for free via RSS for future updates. Image: Foxshots/Hooley.co.za With his comedy glasses and wig, this surfer is South African through and through. Image: George Karbus How fitting that such a green-tinted wave should come to shore in Ireland. Image: kablammm@gmail.com This balding surfer doesn’t look like he knows what he’s letting himself in for. He doesn’t even have a wetsuit on! Image: Ben Selway Thanks to this superb snap, you can stare right down the barrel of a truly gorgeous wave. Image: Tom Mosley A lone rider strikes a pose atop his board. Image: Jacob Cockle Another photo from Praa Sands, this time black and white and with a far more aggressive looking wave, which spews froth high into the sky. Image: George Karbus Like an ice sculpture, this wave appears frozen in time. Image: CDling Playing in this just doesn’t look safe. Strong waves churn up the sand from the seabed. Image: Helmetboy A boat’s crew looks on as an enormous wave approaches. Image: Kernish The morning sky glows in the background behind this small, collapsing wave. Image: Andy James With nothing for scale, it’s hard to tell weather this wave is 10m or 10cm in height. Nevertheless, it’s perfectly formed. Image: DavidRphoto This seriously impressive barrel is long and very powerful. Not to be underestimated. Image: Alun Davey Less of a wave, more of a splash, but I had to include this incredibly HDR image in the list because it looks so good. Image: Caese I love the vintage quality this photo has. It depicts a massive wave crashing into the Spanish shoreline. Image: Unknown As one wave is reflected off a Hawaiian cliff, it meets another coming in from the ocean, creating this rather unusually shaped peak. Image: Malene Thyssen This dark wave was formed by the wake of a ferry en route to Denmark. Each individual ripple is perfectly clear. Image: NOAA The waves in this image, captured from the deck of the M/V Noble Star during a heavy storm, are relatively small, but there’s something rather unsettling about their dark color and form. Image: Dude Crush This image shows a wave captured from under the water with a school of small fish clearly visible. Image: Kyle Black The composition of this image is superb. Looking down to the ground, the surfer appears to be weighing up the risks of dipping into such a tumultuous ocean. Image: Sunshine Surf Safari A wave breaks with the city skyline in the distance. Perfection. Image: El Murko Bigger isn’t always better. Here, the waves are no larger than small ripples and the view is one of peace. Image: Rhanchard Anybody who has visited Cape Town will know that the coastline in this Photoshopped image actually runs in the opposite direction. This doesn’t, however, take anything away from the beauty of this photograph. Image: Grannysue1 A massive wave comes crashing down on a deserted, golden beach. Image: Mike Baird A Canon 5D camera and an ultra wide angle zoom lens were used to create this cinematic shot. Image: Andrey Photo Sunlight catches the ocean spray beautifully in this photograph, full of vivid blues.